The Brecknell 6700U series is a point-of-sale interface scale for linking to electronic cash registers or POS systems. "Touchless" tare enhances food handling safety. OPOS compatible. The Brecknell Scales 6700U series is a standard point-of-sale interface scale for linking to electronic cash registers or POS systems. "Touchless" tare enhances food handling safety. ABS plastic housing with 5½ digits seven segments 15 mm / 0.58" high LCD with blue backlight. 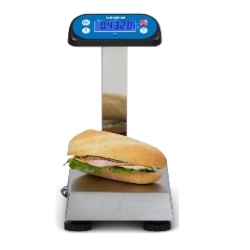 This series of Salter Brecknell weighing products from Central Carolina Scale features quality load cell and electronics ensure repeatable weight measurements and trouble-free operation. A bi-directional 9-pin RS-232 and USB port makes it easy to install. Interfaces to most electronic cash registers and point-of-sale software programs. OPOS developer's tool kit available for POS systems integration. This scale replaces the older Avery Berkel style scales from Brecknell Weighing. Easy-to-Install Bi-directional 9-pin RS-232 and USB port. Interfaces to most electronic cash registers and point of sale software. Quick Disconnect makes all cable connections easy. "Touchless" Tare: Electronic mechanism enhances food handling safety. Operating Keys are Hold/Print, On/Off/Zero, Unit, Tare. 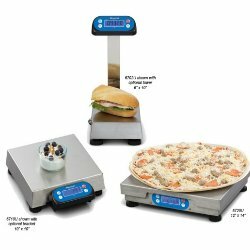 Additional Features: Check weighing, count weighing, peak/hold.